The Garador Design 100 is made up of 4 horizontal skins that give a clean contemporary look. The design elements are cut out of 2mm thick brushed stainless steel and then applied to the door panel. As with all Garador up and over garage doors, the Design 100 is available with either canopy or retractable gearing – and with or without a factory fitted steel frame. 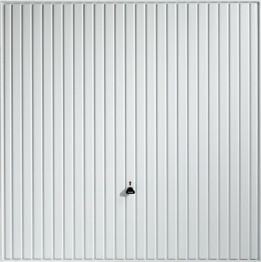 Stainless steel elements on Garador design range doors are manufactured from high grade steel and feature a fine brushed finish. 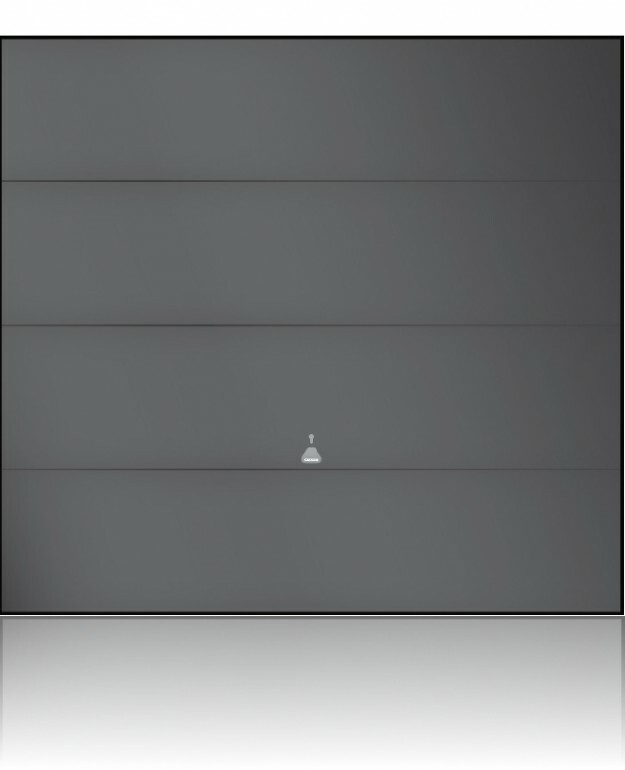 The series Design 100 range doors are also available without stainless steel elements. The doors Design range comes as standard with 2 point locking and can be upgraded to 4 point locking. These garage doors are available in 18 standard colours and also in the exclusive CH 703 which is a metallic anthracite colour and is shown here in the main image. 4 different handles are available or if the door is to be automated it can be supplied with no lock hole as an option. 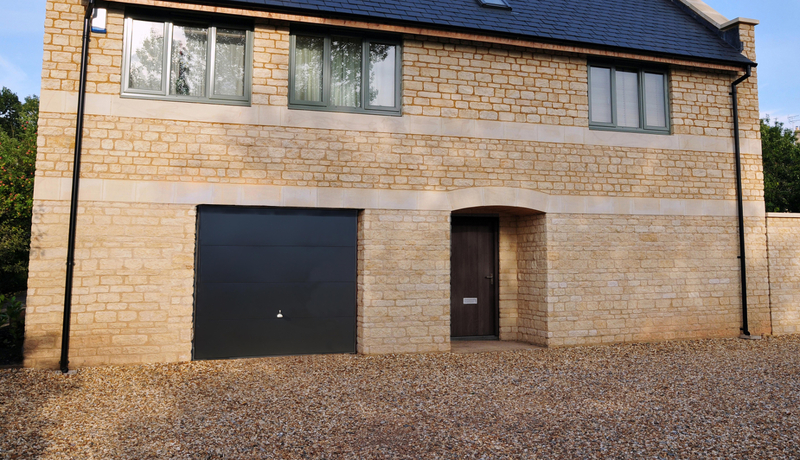 Garador Design 100 steel garage doors are designed to provide you with maximum safety and security whilst ensuring years of reliable, trouble free service and offer excellent value for money. Whatever size of garage opening you have, it is certain we‘ll have a beautiful steel door to suit your requirements. No matter whether you choose a panelled, ribbed or design door in standard white or one of our seventeen standard colours – a Garador garage door adds beauty and value to your home. 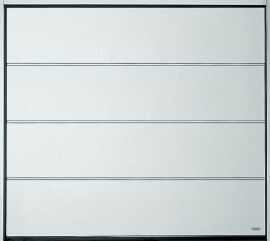 If you’d like to see a Garador Design door for your self we have one on display at our Lancashire garage door showroom. White (RAL 9016) and Terra Brown (RAL 8028) as standard, other optional colours of Moss Green (RAL 6005), Ruby Red (RAL 3003), Signal Blue (RAL 5005), Jet Black (RAL 9005), Steel Blue (RAL 5011), Light Ivory (RAL 1015), Pigeon Blue (RAL 5014), Fir Green (RAL 6009), Anthracite Grey (RAL 7016), Stone Grey (RAL 7030), Light Grey (RAL 7035), Ochre Brown (RAL 8001), Clay Brown (RAL 8003), White Aluminium (RAL 9006), Grey Aluminium (RAL 9007), Window Grey (RAL 7040) and Titan Metallic (CH 703). Stainless steel effect cast aluminium handle as standard. Door optionally available without lock and handle holes. This option makes the door purpose made and will therefore increase lead-time, please specify clearly on order. White, brown and timber effect doors are supplied unwrapped as standard with optional poly-wrapping available. Coloured doors are supplied wrapped and include a touch up stick as standard. Side-hinged doors are provided wrapped as standard. Canopy Gearing is available for all single doors providing a reliable and afforable gearing solution, with no tracks running back into the garage. Canopy gear is not suitable for automation.